Let me start by saying that we love Dropbox. It’s a great product for the price and almost all of our small business customers choose to use it, and for good reason. It’s almost magic how all of your documents can stay in sync on all of your machines. That said, there are a few gotchas that you need to be aware of and today I am going to try to walk you through some of those. 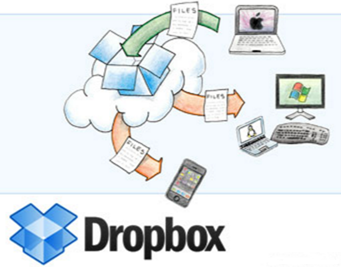 Let’s start with a brief overview of how Dropbox can function. Most of you have a main file repository in the office where the files actually live. These are then mirrored into Dropbox in the cloud. For small files the uploading is very quick. Larger files or large groups of them can take longer. This is dependent on your internet speed. These files are then available remotely via two methods. First, you can simply log into the Dropbox website and download what you need. When finished, you can upload your finished copy back to the site and the file will then sync to all of the clients. This method works well if a number of people need access to the files AND you have good internet where you are working. You do have to be careful to make sure that only 1 user is editing a file at the same time. If there is a file on Dropbox and another user downloads it off the web and starts to work on it, there is no way for us to know that information. If I go out and download it at the same time, then we will both have the file independently from each other. If we both make a change and upload it back, then one of 2 things can happen. Either the 2nd upload will simply overwrite the 1st one and the other user’s changes are lost, or a 2nd version is created and the file is renamed to Conflicted Copy of <filename>. There is no method to merge those changes except manually. More sophisticated Document Management software tries to solve this problem by having users “check out” the documents and marks them as checked out. This way no other user can edit the file while it is checked out. They can only download a read only copy. While this solves the initial problem, it introduces another one. Now you have to save a copy locally to edit it if you need to make changes to a document that is checked out unless you have the rights to over-ride it in the software. Dropbox was originally written to allow a user to keep a copy of their files on more than one machine. Dropbox then started adding features to support multiple users and teams. The 2nd way that users can access their files remotely is by using local file sync. If you install the Dropbox client (desktop version) on Windows, or Mac, it will ask you if you want to sync your Dropbox to this machine. By default, it wants to sync the entire Dropbox folder. This is not a problem if you have a small Dropbox with 20 or 30 Gigs of files, but it can be an issue if you have a large Dropbox. Many people have Dropboxes that are over 500GB in size. At the same time, more and more laptops are coming with SSD drives that might only hold 128 – 256GB. Obviously you have to have a hard drive that’s big enough to hold the Dropbox if you want it to all sync. IF YOU DON’T CHECK THIS FIRST IT WILL FILL UP YOUR ENTIRE HARDDRIVE. It is important to note that apps like Dropbox on a phone, tablet, or even in the Windows 8 or 10 Modern apps, are simply alternatives to using a browser to seeing your files. The files are still living in the cloud (mostly) and have to be downloaded before you can use them. Synced files are all copied to your local machine in bulk. Dropbox also has a nice feature called Selective Sync. 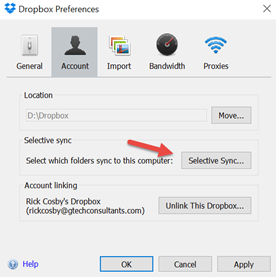 Selective Sync allows you to choose some of your Dropbox folders to sync. This means you can choose to sync only a few folders that you are using right now. That can be a good way to carry around some of your files and keep them in sync with Dropbox. Syncing these files means that a local copy is actually downloaded to your machine. That means that the files open quickly when you click them and when you save them, they are synced back to the Dropbox in the cloud, and then onto the other machines. So, if this works so well, then where is the gotcha? What you will find is that things work very well indeed when you are online. As long as your computer is online, if you open a file that Dropbox sees is open elsewhere it will try to warn you that another user has it open. That said, the reason that you want to sync is so that you can use Dropbox when you don’t have access to the internet. Let’s imagine that two attorneys each have a laptop with the same Dropbox files synced. In addition, these files reside on a server back at the office. They enter a courtroom where there is no internet service. At this point, there are three copies of each file that is on those machines. If someone at the office makes a change to a file, then the attorneys won’t get that change until they connect to the internet and allow Dropbox to sync. 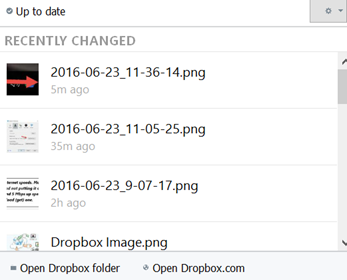 Dropbox may have to index files before syncing and this can take some time on large boxes. If the two attorneys both open the same file at the same time and make changes then we have the same problem. Neither will get the other’s changes nor will the office. When the machine’s sync up later, there will be conflicting copies. The only answer to the problem is good communication. Remember, the same file can be open in multiple places but only one person needs to be making the changes. Make sure everyone knows who is doing what. Make sure that the office staff also understands that they can add new documents to the folder but not to edit any existing ones unless you discuss them first. You will not see the new ones until you get internet. And when you leave, think about how you are going to sync any changes. You will need to connect to the internet and let Dropbox sync up before the changes are all distributed. There are a couple of ways to tell if Dropbox is synced. The icon on the taskbar should show a green check box. That is not always accurate, however. If one person made changes, then their machine knows that changes have been made, and their icon would not be green. The other machine will still show green since it doesn’t yet know that the changes were made on the other machine. Once it connects to the internet and realizes that there are changes, the icon switches from green and shows syncing. If you right click on the icon, you can see the most recently synced files and the time they were synced. And, of course, you can simply navigate into the folder and open the files to make sure that you have the latest version. The key to avoiding these gotchas is to understand how the process works, communicate clearly who is responsible for making changes, and make sure to plan some time to sync ALL of the machines as soon as you can. With a little foresight and planning you can avoid most of the traps. There is one other point that I will make about syncing Dropbox to remote machines. Please remember that these files are now on your machine. Make sure that laptops have a good password and that encryption for the hard drive is enabled if it is available. Laptops can be stolen and the information on them can be accessed by the thief. It’s also not uncommon for them to be left in restaurants and bars, especially in airport locations. Security isn’t just about passwords, keeping the machine physically safe is just as important.